On this Sunday of Great Lent, we remember St. John Climacus or St. John of the Ladder. He was the abbot of the Monastery of St. Katherine on Mt. Sinai during the seventh century. St. John wrote The Ladder of Divine Ascent, which is a guide to ascetic living (living a spiritually disciplined life). This book is read in every Orthodox monastery during Great Lent. In this book, St. John writes about 33 rungs of the ladder we climb in our ascent to heaven. Each rung represents a different Christian virtue (obedience, repentance, love, humility, etc.). In today’s Gospel passage, we are shown that through faith in Christ all things are possible. We too need to cry as the father in today’s Gospel, “Lord, I believe; help my unbelief.” Furthermore, this passage reveals that faith to conquer our demons comes only from prayer and fasting. At this point, Christ begins to reveal to the disciples about His upcoming suffering. What did the father need to do for his son to be healed? Why could the disciples not heal the boy? Do we believe that with the Lord all things are possible? Jacob’s Ladder—Read the Old Testament story about Jacob’s Ladder, which can be found in Genesis 28:10–17. The ladder represents the Theotokos. Talk about how Jesus came down the ladder in order to show us how to ascend it to heaven. Talk about things that help us climb the ladder to heaven and things that make us slide down. For young children, the gameChutes and Ladders can be helpful in illustrating this point. Icon of the Ladder of Divine Ascent—This is a very vivid icon of the Ladder of Divine Ascent. It shows people ascending toward heaven with angels helping them. It also shows demons pulling people off the ladder, causing them to fall into the pits of hell. It can be a great discussion starter, especially for teenagers. Consider making copies of this icon for each family member to keep as a reminder of their spiritual ascent and the demons that will be trying to prevent it. This icon can be viewed atwww.comeandseeicons.com. Lord, I Believe; Help My Unbelief—Challenge your family to use the plea of the father in today’s Gospel passage as a prayer throughout their day. Remind your children that we should constantly be calling on God to help us. Ascend, my brothers, ascend eagerly. Let your hearts’ resolve be to climb. Listen to the voice of the one who says: “Come, let us go up to the mountain of the Lord, to the house of our God” (Isaiah 2:3), Who makes our feet to be like the feet of the deer, “Who sets us on the high places that we may be triumphant on His road” (Habakkuk 3:19). Run, I beg you, run with him who said, “Let us hurry until we all arrive at the unity of faith and of the knowledge of God, at mature manhood, at the measure of the statures of Christ's fullness” (Ephesians 4:13). O holy father, hearing the voice of the Gospel of the Lord, you have forsaken the world, counting its riches and its glory as nothing; and so you have cried out to all: “Love God, and you shall find eternal grace. Set nothing higher than His love, that when He comes in glory you may find rest with all the saints.” At our prayers, O Christ, guard and save our souls. 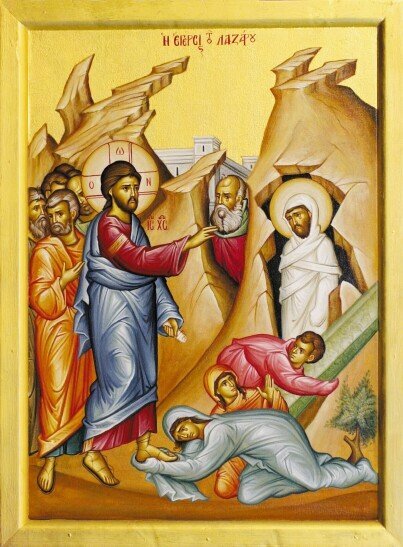 The Ladder of Divine Ascent by St. John Climacus—This classic in Orthodox spirituality examines the steps to climb while ascending in the ascetic life. Because it was written with monastic living in mind; the faithful should approach it with the counsel of their spiritual father. Published by Paulist Press. Theosis by Anthony Coniaris—This excellent book for both adults and teenagers talks about how we can achieve our potential in Christ. Published by Light and Life Publishing. The Akathist Hymn by Eikona—Excerpts from this service, sung in English, invite the faithful to rejoice in the unique and sublime role the Virgin Mary played in the salvation of mankind. This CD and others by Eikona can be ordered at www.eikona.com.